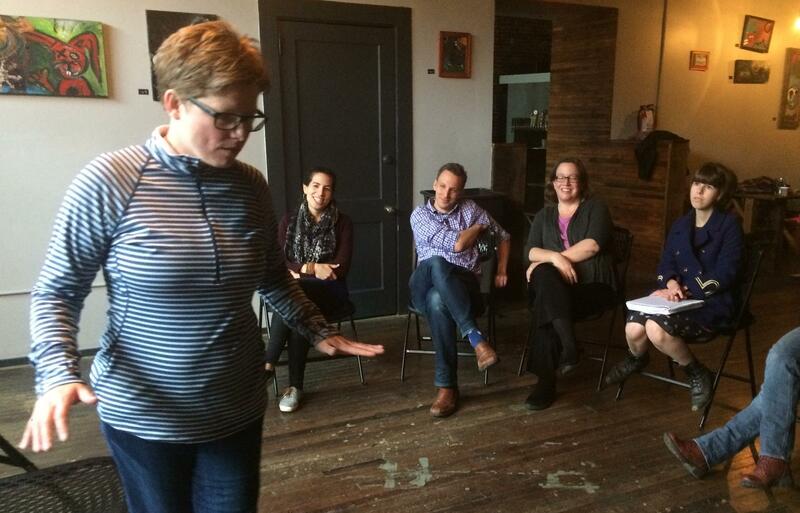 Students in an Asheville Improv Collective class of pastors performing a solo character exercise. Brian Ammons is the chaplain at Warren Wilson College. He and Missy Harris, the co-pastor at Circle of Mercy in Asheville, thought improv classes would bring dimension to their ministry. They invited several of their colleagues from other churches to join them. In improvisational theater, there might be a form or structure to what’s happening on stage, but nothing is scripted or planned. For one exercise, Hall is challenging his students stand up one at a time, in front of the class, and perform a lightning-round of characters. Most improv students call on one or two go-to characters or voices. Some of these students have a predictable propensity to play some version of a Southern preacher. That’s why this particular exercise is so important for these students—with Hall calling for new character after new character, everyone has to discover someone new, on the fly. These pastors certainly aren’t typical. They curse. One student playfully flipped another the middle finger after a sarcastic comment. And they’ve surprised their instructor in other ways. These clergy have already performed three public showcases—the reward for completing each level of class—and are about to perform their fourth and final showcase before graduating, 8pm Sunday, April 14, at Attic Salt Theatre in Asheville. They hope to continue in the local improv scene as a troupe, performing as The Irreverends.